Our today’s traveling route is Yusmarg----Darwan---Charar-i-Sharif---Nowgam---Chadoora--- Rambag--- Lal-chook---Dal-gate---Boulevard Road----- Zesta-devi temple complex (at Boulevardier road), where @ Srinagar city, we camped till we stayed in srinagar. Since we knew that the distance in between Yousmarg and Srinagar city is only 45 Km. So, we got up leisurely, took our own sweet time to freshen up, repacked our baggage, got the bikes ready and then finally tied our baggage to our motor bikes. Because of the lack of tourism departments interest no breakfast was available at the tourism department’s huts. So, after settling our cottages rental bills, we rode to a nearby road side tea stall named as "Khanna Kazaana". Though the name is big as "Khanna Kazaana", but it had nothing other than the basic breakfast of tea and biscuits and nothing else. After having our basic breakfast, from there we rode our motor bikes towards our onward journey to Srinagar city. Actually today’s journey was practically just ridding, ridding and nothing other than just ridding. Because, all along this route till Srinagar, there are no tourist places to visit, except a very prominent and famous “CHARAR-I-SHARIF” a Muslim shrine. Charar-i-sharif counts amongst the most sacrosanct Muslim shrines in India. It is situated approximately 40 km from Srinagar, enroute to Yusmarg. An intricately artistically carved Wallnut wooden shrine, the Charar-i-sharif is approximately 600 years old. Popularly known as the Hazrat Sheikh Noor-ud-Din Wali, the shrine was built to commemorate Sheikh Noor-ud-Din Noorani, a Sufi saint. The life of the Sheikh is full of legends and tales. He was born as Nund Reshi or Sahazanand to Salar Sanz in 1377. It is said that he refused to drink milk till the third day after his birth, when a Yogini ( Hindu female saint), “Lal Ded” fed him with her own milk. Later, she left the house after saying that the child would be her spiritual heir. Sheikh Noor-ud-Din Noorani or Nund Rishi was the first one to start Rishism in the valley. Later, this Rishism got renowned as Rishi Mat, a Vishnav Mat. The saint preached communal harmony, non-violence, vegetarianism and tolerance to the people. He gathered many followers who called him by different names. Some of the names conferred on the saint are Sheikh-ul-Alam, Sheikh Noor-ud-Din Noorani, Alamdar-e-kashmir, Sarkhel-e-Rishiya, etc. Apart from preaching, the Sheikh made numerous contributions in the field of philosophy also, in the form of verses and poetry. The saint led a very simple life throughout. It is said that nine lakh people gathered at the Shrine of Charar within two days of his death, in 1438. The King Sultan Zainul Abdin also took part in his funeral procession. Charar e Sharif served as his final resting place, where his mortal remains were buried. The Charar-e-sharief of Kashmir, India, has been destroyed twice. The first time, the shrine and its surroundings suffered ruination was when a battle took place between the Indian Army and the Pakistani Army. However, the shrine was reconstructed on the lines of central Asian architecture. Since because of the Muslim fasting month no lunch was available we just rode straight (via Baadgam, Rawalpura, Rambagh, Lal-choke, residency road, Dal-Gate, Boulevard Road) for nearly two hours and reached our final destination (Zeshta Devi Temple complex) where we had booked rooms for our stay till we would be in Srinagar. As soon as we rode our motor bikes on Boulevard, there was something very special in Dal Lake air, which rejuvenated OUR ALL THE FIVE-SENSES. 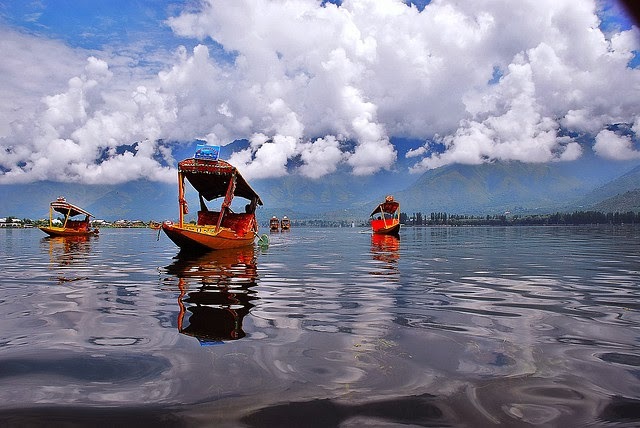 First Sense, the “SIGHT” :----We saw the most spellbound and awestruck serene view of the most magnificent Dal-Lake. Every inch of which is occupied by the endless rows of the most attractive, luxurious, ornamental, deluxe, lavish, lush and exclusively decorative House Boats. Colourful, decorative and luxuriously cushioned “Shikara” taxis those keep sailing while carrying hordes of Tourists. In-between we could see the rowing of “mobile-Shikara shops”, selling Kashmiri handicrafts, Kashmiri artifacts, Kashmiri Shawls, Papier-mâché work items, wooden carvings, cold drinks, eatables, roasted corns and whatever any tourist wish to purchase. And there were many ordinary small boats called in Kashmiri Language as “NAV” which were busy pulling by hands the weeds which have polluted almost all the lakes of Kashmir. These NAV-Walas, are paid daily wages to do the deweeding of Dal Lake. Though there a huge machines also which are used for deweeding, but just to provide employments to youths, government hires these unemployed man force to give them employment. Second Sense, the “SMELL”:--The moment we rode our motor bikes on the the Boulevard, which runs in a semi-circle all around the edge of the Dal Lake, we could breathe in fresh, crisp air which blew straight on our faces, right from the snow clad Pir Panja mountain ranges. The fresh cool breeze was coming from opposite direction which was directly but gently hitting against our faces that we relished it so much, it felt as if it was dream come true event. We heavily inhaled pollution free breeze which filled our lungs with pure oxygen and we could inhale waves and whiffs of the fragrance of the Mughal Gardens variety of fragrance of varieties of flowers. Just to clear our pollution congested lungs, we inhaled our lungs to the fullest. In the bargain that with so much pure oxygen inhaling, we started coughing endlessly, because our lungs are used to only polluted urban air. So our lungs couldn't digest fresh pollution free air. Third Sense, the “TASTE”:--- Drinking the Sheshma-Shai’s, nectar like fresh, sweet digestive, natural spring water, tasted like “Abe Zam Zam”, the divine water. It stimulated our taste buds and we felt as if we were drinking pure honey mixed sweet water that cleansed our mind body and soul. Even we ate tasty ripe, sweet, delicious varieties of fruits such as cherries, apples, pears, apricots, pomegranates, wall-nuts and almonds. These fruits are delightfully mouth savoring. 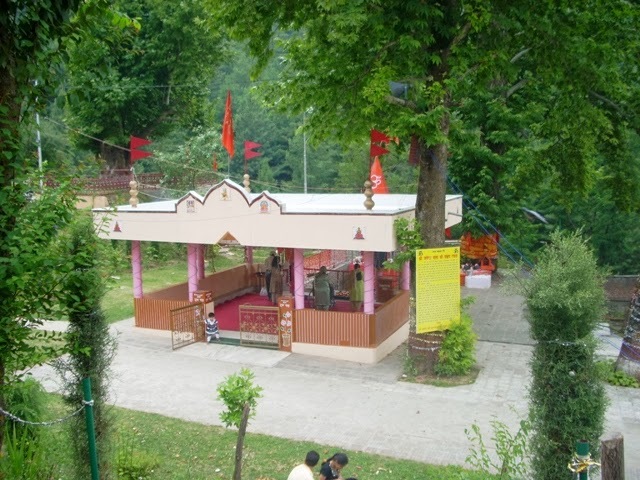 Fourth Sense, the “TOUCH”:--Touching the sanctum sanatorium of few of the temples of Kashmir, like Shankara Acharya, Kheer-Bhawani, Hari-Parbhat, Durga-Nag and Zestha Devi temple made us feel divine and blessed. The touch was awesomely blissful, peaceful and heavenly. i) Mandara Parvata, ( the biggest mountain that alone could be used as a churner for ksirasagra). iii) Vasukinagaa for offering his body to be used as a rope around Mandara Parvata, that alone has the power to make the Parvata the churner of Ksirasagra. Feeling delighted and getting the help of Mandara parvata, Narayana and Vasukinaga, the Devtas and Asuras started the process of churning. Although initially they got fourteen gems of which one gem was in the form of Goddess Lakshmi but suddenly it started evaporating poison in the form of Kalakuta or Halahala-- the terrible poison having its lethal effect to destroy whole universe instantaneously. The Devas who were given the control over thirteen gems, too were frightened about Kalakuta. Being of a very virulent character, the moment it appeared after churning, it started engulfing everything and burn it up. It was beyond their power to control it. They were desperate and adored Lord Shiva to come to their rescue. The Lord, who is Trilokinatha, protector of the Universe, was pleased and bestowed his Anugraha to his creation by consuming the poison. But in order to protect Parvati (Lord Siva's energyies), he stored it in his throat. That is the reason why Lord Siva's throat is bluish in appearance. The Devas and Asuras were delighted and they again adored Lord Siva by addressing him Nilkantha. The rooms in the Zestha Devi temple complexes have to be booked well in advance. 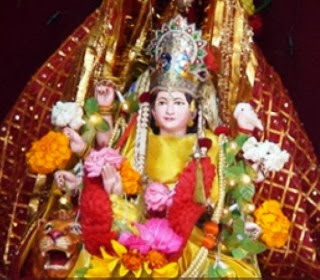 There is a Zeshta devi temple website for the room bookings. Since there are only 20 to 25 rooms and almost all the Kashmiri Pandits from all over the world,who throng Srinagar during summer, can’t just walk in and get a room. Since the rooms are limited, so online booking is a must. Though online we had booked our rooms well in advance. But, when we went there we realised that we had reached, one one day earlier than our actual booking date. So for a day we compromised and we agreed to stay in the dormitory itself. Dormitories can accommodate round about 30 people and every one has to go out for washrooms and toilets. The rooms have its full-fledged kitchen, with cooking gas, cooking vessels, Geezer, attached toilets, beds, wall to wall carpets, bedding for 5 to 6 occupants And the charges are unimaginably so nominal. There is a shop at the entrance of the temple, which serves you Kashmiri-Kahawa tea, Loochians, Pakoodas, Nathur-munzians, etc. He sells all the required stuff for your own cooking also. The location of the temple is beautiful. 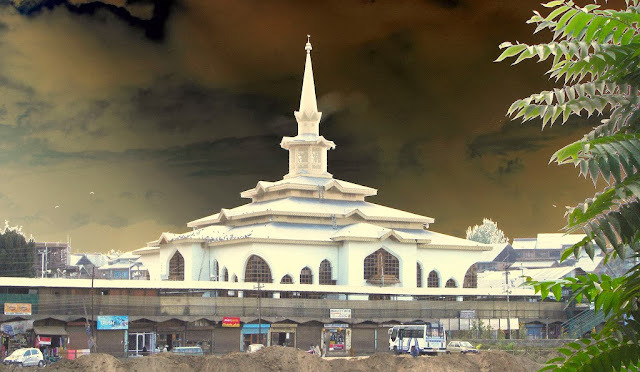 On one side of the temple, there is Governor house, on the other side there are five star hotels Oberio and Laala Palce, at the back side of the temple there are Zabawan mountains and in the front of the temple there is a breath taking panoramic view of Dal Lake. The temple is at an amazing location. The only problem is that to stay here you have to have your own vehicle, otherwise you are stranded and handicapped. Vegetarian breakfast, lunch, dinners are available at very reasonable price. The sanctum sanatorium of the Devi looks a replica of "Kheer Bhavani" temple also called as "Tulmul". Today once we settled ourselves in the dormitory, since we were tiered, we just relaxed and didn't go out anywhere, other than at late night we went out just to have dinner. We were here for five nights and we really enjoyed out stay. Because of the early morning Pooja at the temple, we enjoyed the devotional, soothing and peaceful surroundings and divine atmosphere. Thanks for sending the travel blog. It is soul soothing as the memories come alive. The pictures and narration have lessened the sting of my life in exile. Thank you SNP, Shweta, Suhadaf , Bushan Parimoo and other anonymous respondents for enjoying reading my travel blog. I appreciate your feedback.